Complete With Sharp- Fire Attachment Watts = 725 Input Voltage = 110 Volts Rpm = 0 - 4000 Bit Re.. Features -No load speed 0-1,700/min. 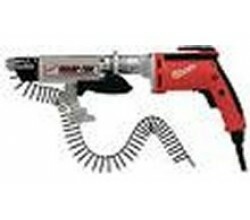 -Capacity for self drilling crew: 8mm (5/16") -Capacity for..